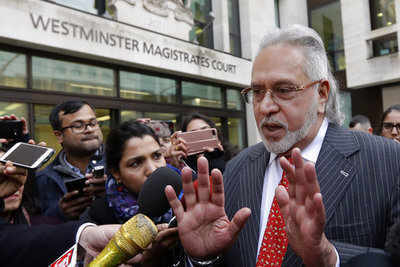 MUMBAI: The Enforcement Directorate (ED) on Tuesday cleared the “restoration” of absconding accused Vijay Mallya’s properties to the State Bank of India-led consortium of banks. The investigating agency, however, also said that in the case the court allows the plea, banks should give an undertaking about returning the money. “In case the court deems fit to allow the application, it shall take an undertaking from the applicants (banks) to return the amount with interest in case the court at any point deems it fit and appropriate, in the interest of justice, to deposit the amount before it or to the complainant (ED) without delay,” the ED said in its reply to the lenders’ plea before special Prevention of Money Laundering Act (PMLA) judge M S Azmi, seeking the restoration of Mallya’s properties. In its reply, the ED said that since all applicants except one were public sector banks, the money sought to be recovered was public money and, thus, “restoration of assets” in favour of them was in “public interest”. The agency asked for the application to be allowed in the interest of justice and equity. On January 8, SBI had submitted the application seeking “restoration” of the properties attached under the provisions of the PMLA. The banks had claimed approximately Rs 6,200 crore along with an interest of 11.5% per annum from 2013. The ED submitted that the accused had argued that certain properties, including shares and debentures – being amenable to market fluctuations, which are at an all-time high – require to be liquidated without delay to realise their best value. Iterating that all but one were public sector banks, the ED pointed out that they had the backing of the state and thus carried with themselves “a sovereign guarantee”. “Thus, in the unlikely event of the respondents (accused) prevailing, the banks would be in a position and capacity to return the proceeds of sale of assets to the respondents. As a safeguard for this possibility, the complainant asks this court to order the applicants to file a guarantee in this respect,” the ED said in its reply. The court has directed the interveners to submit their replies on March 5. On Tuesday, the court adjourned the hearing on the part of the confiscation of his properties to March 12. The defence is likely to file an appeal against the January 5 order.